ID IN AN EMAIL FROM PEGGY FRENCH --- THANKS PEGGY! "As I was looking at your brick under the C heading, I noticed a mistake on Cleveland Vit.Brick OK City the next colunm should be Cleveland, OK not OH. Also I noticed you did not have any city for your CAPITAL brick. 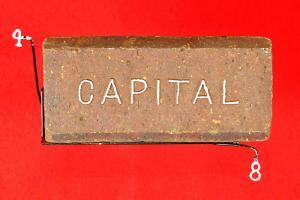 I think it is an Iowa brick maybe DesMoines but Jim Graves would know for sure."